MARIETTA, Ga. - February 1, 2011 "You're never too young to quilt or too old to rock 'n roll!" So says Mary Anne Henderson of Red Hen Fabrics and you've just got to love a shop with a slogan like that. 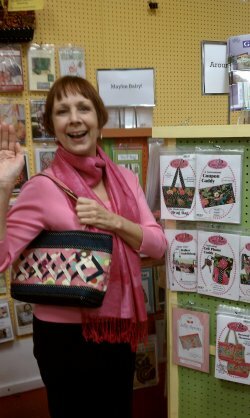 Visits with Mary Anne and Red Hen are always interesting especially since it's an opportunity to see the latest of her beautiful, dynamic displays and makes each visit a bit of an adventure. The rotating and brightly colored pegboard racks are wonderful ways to show off pattern inventory and efficient product rotation. Mary Anne is a Henry Glass fabric designer and this talented lady’s sweat equity has rehabbed four very basic walls into a beautiful www.redhenfabrics.com for pictures of the transformation.